From 1963-66 Chantrell master-minded poster design/illustration for the Carry On series of films creating a run of very collectable posters including Carry On Cabby and Carry On Screaming. 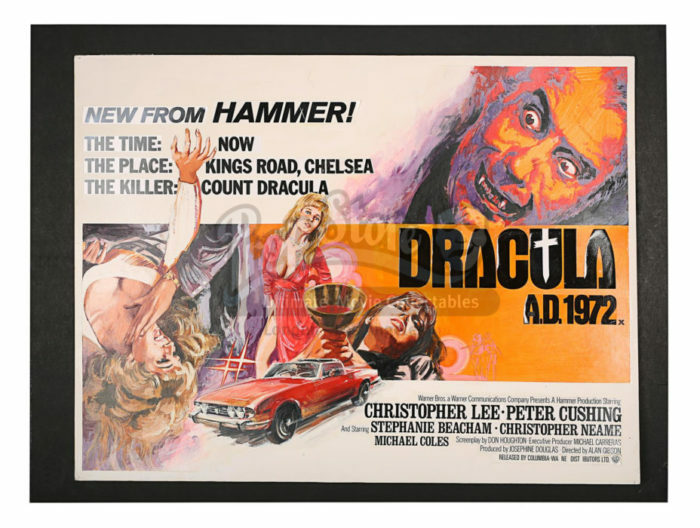 Between 1965-70 Chantrell was responsible for all UK Hammer Quads including One Million Years BC and Dracula Has Risen From The Grave (this original artwork now housed in the collection of the Victoria and Albert Museum). Chantrell was the consummate commercial artist, having a range of artistic styles, being able to both design and illustrate and to suggest witty tag-lines when necessary. 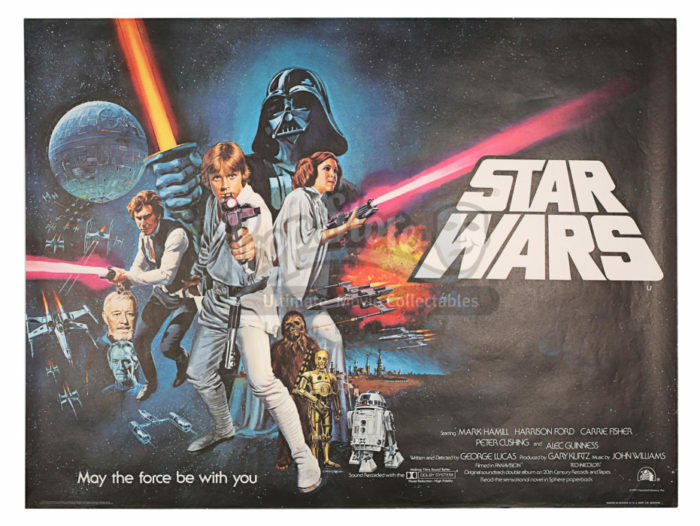 As the industry became more Corporate, Chantrell branched out as a freelancer in the early 1970’s and it was during this period that Chantrell landed arguably his most famous commission – the Quad poster for Star Wars. Chantrell’s original prototype artwork for the 1980 re-release Quad for the George A Romero zombie film, Night Of The Living Dead (1968). As comparison with the finished Quad shows, Chantrell captured the essence of the film poster with this conceptual design. Although most artists did a little design work alongside their illustration, Chantrell was one of the few who was equally at home with both tasks. In some cases Chantrell would submit two-three prototypes but it is believed that in this case the artist “nailed” his brief in one. Chantrell was paid £287.50 for this concept art and the finished art together. NB. 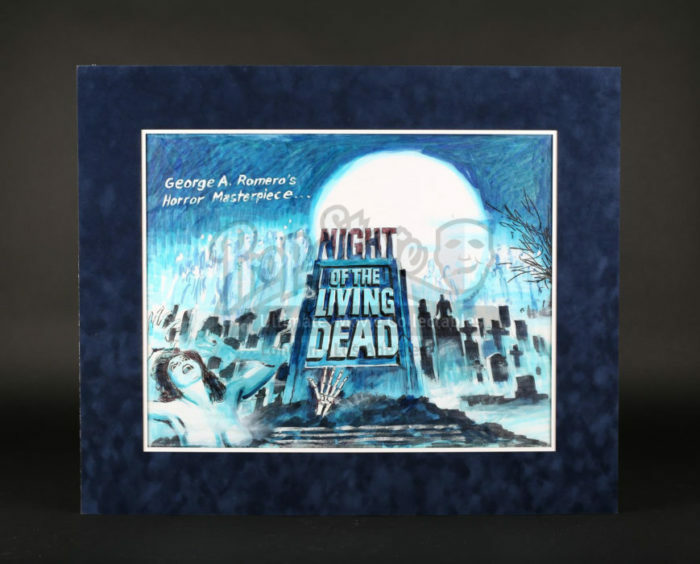 The artwork is sold with an original folded Quad of “Night Of The Living Dead” (1980). Condition: Excellent. Artwork mounted but otherwise unrestored, the original artwork on layout paper, mostly being pen outline and magic marker. Quad poster folded, unrestored and with heavy foldline wear. A rare unfolded “Non-Oscars®” Quad for “Star Wars” from the archive of the artist Tom Chantrell. 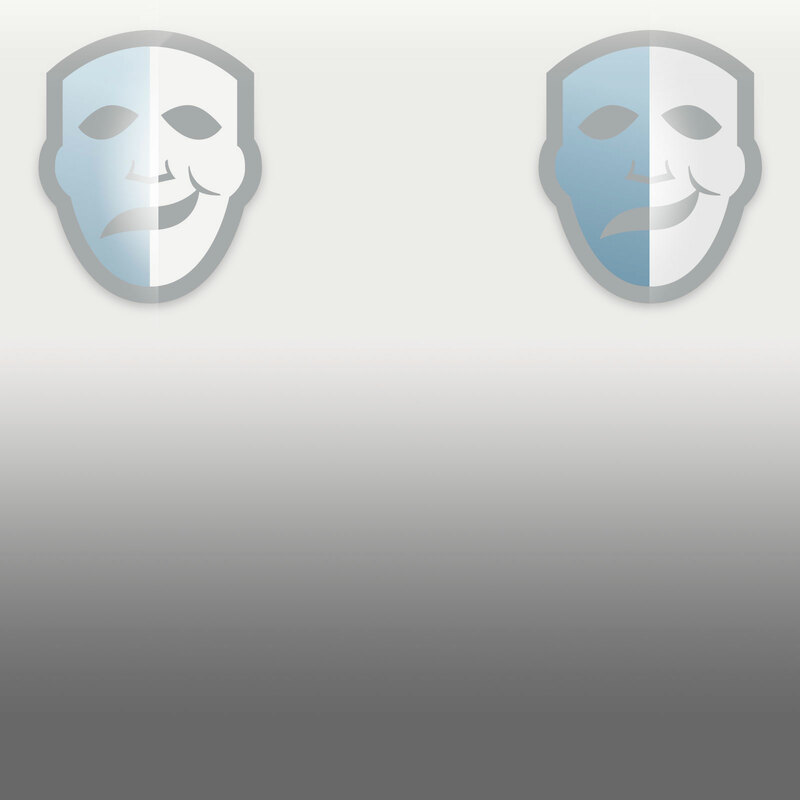 This “proof” poster was provided to the artist for approval prior to the release of the film. The “Non-Oscars®” version of the Quad was used for a short period following the film’s premiere and was superseded by the “Oscars®” Quad as the film was released across the country. The “Non-Oscars” Quad was printed in much smaller quantity. Condition: Excellent. Unrestored unfolded and in near mint condition. An interesting Chantrell prototype artwork for Hammer Films, the imagery being very close to that used for the earlier Quad poster for “Taste The Blood Of Dracula” (BBFC certificated Feb ’70). 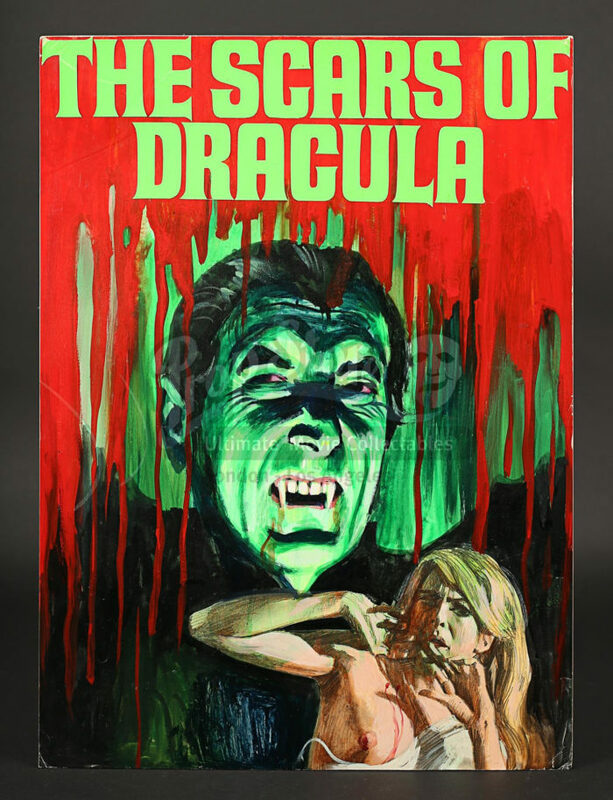 Chantrell was known to re-cycle his own work so it is possible that in order to meet a deadline this unused artwork was re-titled for the subsequent film (“The Scars Of Dracula” certificated in Sept ’70). It is likely that this artwork was a prototype for a marketing brochure rather than a poster. Condition: Good. Acrylic paint laid to “Legion” artboard with a day-glo card title script, slight creasing to bottom corners and two faint mug marks to left hand side. Chantrell prototype artwork for the Quad for Hammer’s “The Viking Queen”. The piece is in “almost” finished form with the title and central figure being particularly impressive but Chantrell seems to have experimented with the cast/credits script bottom rim. Eventually Chantrell provided an alternate piece of artwork that went to print. “The Viking Queen” was one of a number of Hammer attempts to diversify away from their staple of horror genre films. Like various other Hammer projects, an exotic European beauty was drafted in to occupy the leading lady role, in this case a Finnish model called “Carita”. Condition: Good. Gouache and pencil outlines on artboard with a day-glo card overlay for the title and a photographic image of artwork overlaid bottom left. Other text both directly painted and overlaid on layout paper (this incomplete). Artwork framed and glazed. Three different painted artworks Chantrell completed for Hammer Studios for the mooted film “Creatures The World Forgot” (the film released in 1971). However, these are not poster prototypes but specially commissioned pre-production pieces created as props for Hammer executives to use in their meetings with potential (American) financiers. Chantrell had an exceptionally close relationship with Hammer, designing and illustrating their UK cinema posters 1965-70. During this period and for several years after, Chantrell also provided artwork for pre-production flyers but on some occasions (as here), Chantrell was tasked to create artwork for financing pitches. The idea was to create something that looked like finished poster art and encapsulated the style and content of the proposed Hammer film. The way Chantrell collaborated with Hammer Studios in this regard is believed to be unique in the British film industry. The three pieces created show a progression in Hammer and Chantrell’s thinking about the setting of “The Creatures The World Forgot”, the concept morphing from “modern meets prehistoric” to a more straightforward re-hash of “One Million Years BC” (as the funding was uncertain and often the scripts unfinished, this allowed Hammer and Chantrell some latitude). All three artworks are shown in order of completion and the artist has signed each piece. Chantrell framed all three pieces and had these exhibited at his home. Condition: Excellent. Gouache on card with card painted title overlays on 2 examples, all mounted on black board and framed. Although this appears to be finished artwork for the Quad poster, there are a few small differences which suggest Chantrell produced a second alternate version. Although the 1976 biopic “Goodbye Norma Jean” did not feature the long gone Marilyn Monroe, it is her likeness that Chantrell provides. Having provided beautiful illustrations of Monroe during her heyday (i.e., Quads for “Bus Stop” and “Let’s Make Love”), Chantrell had plenty of reference material to draw upon. Chantrell has signed this artwork. Condition: Excellent. Gouache on card. 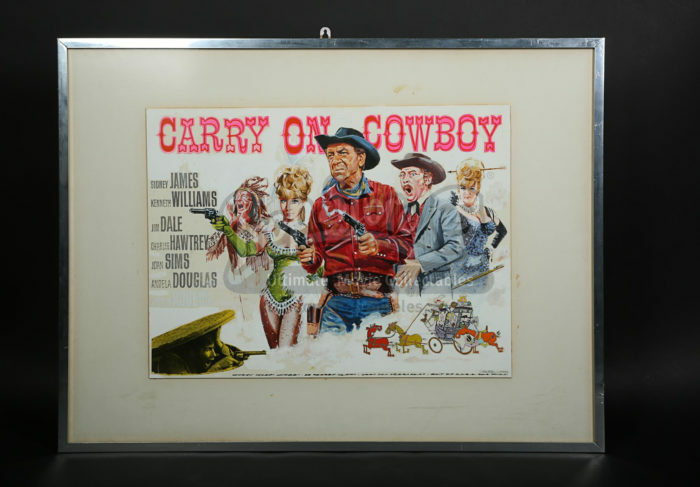 If you liked what you saw, then why not check out some of the amazing pieces of original art and collecatble posters all currently up for auction in the Prop Store Cinema Poster Live Auction, and find yourself your very own piece of movie art history.